Let’s teach how to rhyme with these rhyming activities for kindergarten. 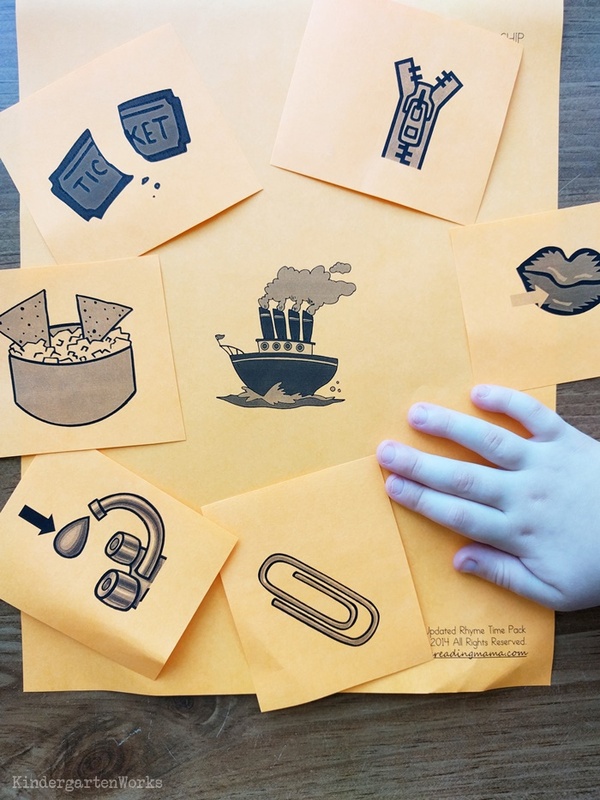 Here are 8 free rhyming activities you can use with your kindergarten students in guided reading groups so they can learn how to hear and identify rhyming words. I once thought that rhyming was just something that kinders knew or didn’t know. I just thought that they had to “get it.” Oh, little did I know. Then I figured out how to teach rhyming words orally with some nifty hand motions. This made it much easier to teach how to listen for word parts that sounded the same to my non-readers. For some students, they didn’t need a lot of rhyming practice after learning to hear rhyming words orally, until they were ready to focus on why words rhyme based on their word chunks and word bits. That usually came around being readers at a level 5-6 or level D.
For others, they really struggled with hearing rhyming word pairs and identifying when words rhymed and generating rhymes for words. These kinders usually needed more phonemic awareness practice and I sought time to work with them during our guided reading groups. This list of rhyming activities for kindergarten are the resources I found and printed off to use in my groups. I didn’t use every single activity with each group. Rather, I picked what they needed most and tried to use the materials to create an activity or mini-lesson that would help us practice that skill. We did this type of work in small groups so they could get the attention they needed, they could watch my mouth over-enunciate close up and could get more turns trying since there were fewer numbers of kiddos working on the skill at a time. 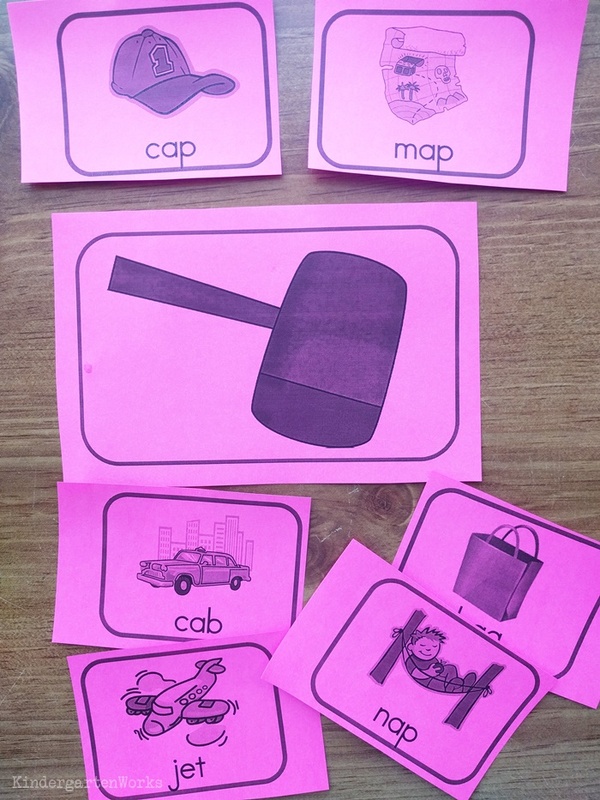 I used these free printable rhyming resources in my small group instruction in order to help make rhyming more visual. Because let’s be honest – it is a skill that begs for this type of scaffolding support. 1. Rhyming Bingo is such a classic activity. Grab whatever counter-style manipulatives you keep with your guided reading materials to use to cover up spaces. There are 4 different mats you can print. This one will be tricky for some students – if you call out “house” some students will just want to find the house on their card versus finding the rhyming match – mouse. So, instead of using the answer key provided in this resource, I say write down a new rhyming word next to the rhyming words provided on the answer key. I might even write down or call out a nonsense word and say I’m speaking like an alien robot. They have to “decode” my alien robot language by hearing the correct English “human” word. That would spice it up a little and help students avoid just wanting to identify the picture called out. 2. There are a few different resources you can print in this Rhyme Time packet. Personally I liked the rhyming picture cards and also the sorting mats. The mats were designed to be cut and paste pages, but I felt they worked better as sorting mats for my small groups. I would pass out all cards to my students in the reading group. Then I’d lay down the mats and we’d use hand motions to isolate the rime part of each word and they’d look for matching cards to add to the mat. We’d go over the results of each page, checking our work. If we repeated this activity, each time they would get less and less specific direction on how to isolate the rime in each word card they had. You could also flip the activity and give each kindergartner a mat. Then call out each card (and show it like a flash card) and isolate the rime in the word together. Students check the word on their mat to see if it’s a rhyming match. If so – they get to keep the card and add it to their mat like points! 3. If you’re looking for a quick set of Rhyming Picture Cards, then these are a good fit for kindergarten. You can cut the cards apart to play memory or even a simplified version of go fish. If students are really struggling with vocabulary or rhyming, show just one card and limit the number of cards to pick from. Show just 2-3 cards to pick a match from in this case. To work on coming up with rhyming words, you could show a picture card and ask students to generate nonsense or silly words that rhyme. They could earn counters in a ten frame for each correct response and try to beat their best score from last time. Sometimes having an alphabet chart handy is helpful. That way you can guide students to pick out a consonant letter to replace the onset in the word card you showed. 4. You could do any of those same activities with these Winter Rhyming Picture Match cards. I stored all of these resources from this list in little ziploc bags inside expandable file folders. That way it kept my guided reading table uncluttered and I could easily pull out and put away what I needed for each group. 5. 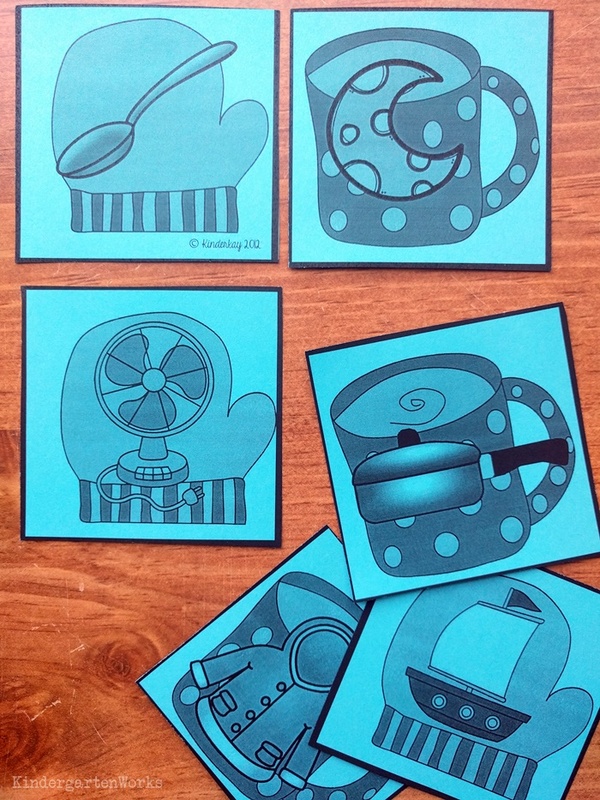 Another set of rhyming picture cards I used came from this Whack a Rhyme printable activity. Designed to be played as a game, students whack the mallet when a new card is flipped over rhymes with the card of another player. This game requires students to quickly go through multiple cards (sitting in front of other players) to check if the new card rhymes. So I adapted this but kept the mallet since it makes it fun. I placed one rhyming card down next to the mallet. This became the card we were looking to match. Then I held, read aloud and flashed the rest of the cards one by one as students listened for a rhyming match. 6. As a review or a check-in style assessment piece I might’ve used this Silly Sally Rhyming Worksheet. I would have explained the directions and drawn a smiley face and a sad face on the color code box to help students recall which color to use. Then I’d point to each character and read the word pairs aloud. I’d have students color the character red if they rhyme and yellow if they don’t. There is potential that I’d use this as a way to show parents how their child is progressing on this specific skill of identifying if words rhyme (but I wouldn’t use it to show if they can generate rhyming words – that’s a different skill). 7. 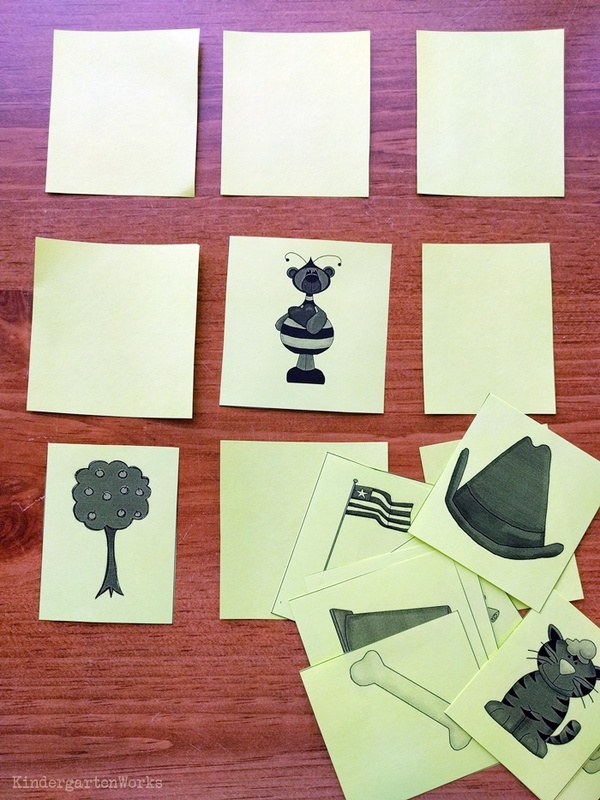 When students are ready to make the transition to understanding why words rhyme using letters and word bits, I use Rhyming Mini-Books to teach students how to generate and read short rhyming words quickly. 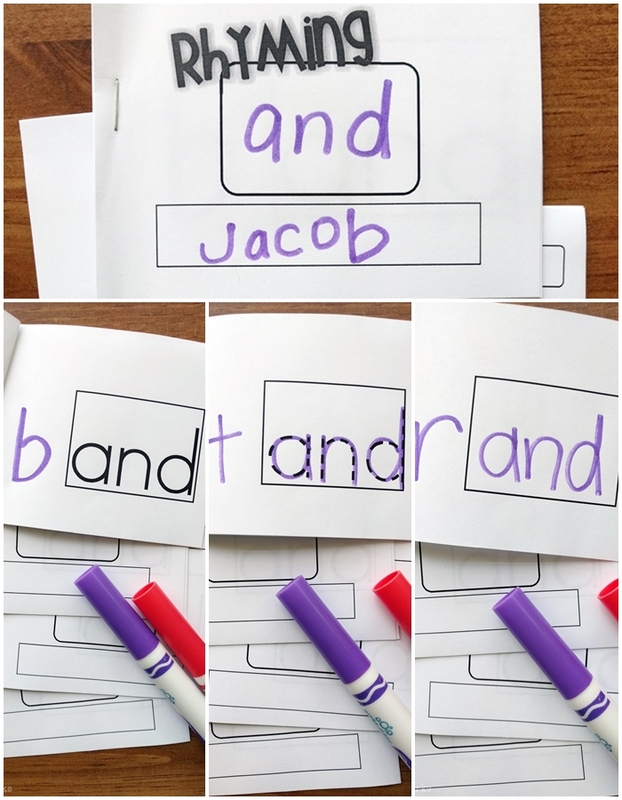 Teaching this skill really helps kinders on the verge of reading cvc words independently to start looking for “bits they know” in larger words as a next reading strategy. 8. The Rhyme Time packet above has an emergent reader you may like, but here is another Rhyming Emergent Reader students could read. I might just fill in the missing beginning sounds/blends in this book and focus on hearing the rhyming words orally instead. And I might also hide/cover the extra text under each picture on the copy machine so it says just “Yes!” for my earliest readers. In fact, I’d take out the page where students write in their own rhymes and write my own page. I’d have students pick and draw two pictures from the book and put them together because they don’t rhyme. This would make an ending to the book that fits the style of other leveled readers – where the last page changes from the pattern of the rest of the book. There – you have access to the same resources that I used with my kinders to teach how to rhyme in small groups! I hope these rhyming activities for kindergarten are helpful to have all in one place with my take on how to use them.